Let our designers create a beautiful floral arrangement for you in one of our unique dishes or basket. Designers choice can really let your gift be a wonderful surprise and some of the best arrangements we do. A 2 Candle centerpiece makes a wonderful gift for any family or friend. 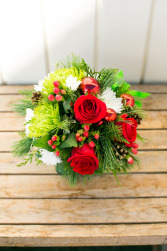 Our designers will fill the table with Nova Scotia Pine and fir and add long lasting red and white carnations , festive mums and bit of ribbons shiny balls and glitter.